What is degassing? When and why should it be done? How do I know if my cleaner is working right? Why is a special ultrasonic cleaner solution required for cleaning? What cleaning solution shouldn't I use? When should I change my cleaning solution? Why should I use an ultrasonic cleaner? What's the difference between direct and indirect cleaning? What is the purpose of the unit heater? How do I drain my cleaner? What can I clean in my ultrasonic cleaner? Check your ultrasonic bath periodically to test the level of activity of the ultrasonic cavitation. Frequency of testing will depend on your use of the unit, however, Branson suggests running this test monthly. • General purpose household cleaning solution, such as Dawn ®2 liquid soap. 1. Prepare a fresh solution with general purpose household cleaning solution (concentration 1%) and warm tap water 49 °C – 60 °C (120 °F – 140 °F). 2. Fill the tank to within 3/8 inch (1 cm) of the “operating level” line. 3. Turn the ultrasonics on for at least five to ten minutes to allow for degassing. 4. Prepare the glass slide by first wetting the frosted portion with tap water. 5. With the No. 2 pencil, on the frosted portion make an “X” from corner to corner. 6. Immerse the frosted end of the slide into the solution. Hold the slide vertically and center it in the solution. 7. Make sure that model CPX/CPHX models are in Timed or Constant Sonics Mode, not Degas Mode, then turn ultrasonics On. The ultrasonics will begin immediately to remove the lead from the slide. All lead should be removed within 10 seconds. If your unit passes this test, its ultrasonic cavitation is acceptable. Precision - the ability to get into the tiniest places and get the dirt out. Some applications are only achievable via ultrasonics. Speed - Ultrasonics is faster than almost any other method for many jobs. This means less time in process, and more parts out the door. Labor savings - Often and entire assembly of sub-assembly can be cleaned without taking it apart. Consistent results - Get that machine set up properly, and ler it rip. Batch after batch of identically cleaned parts. One less variable for manufacturing and QC to worry about. Automation - You can set ultrasonic tanks directly into your production line, and make cleaning just another process step, instead of a time consuming off line process. The environment - using aqueous solutions means no solvents, no greenhouse gases, and recyclable cleaning solutions. Safety - Get rid of harmful solvent vapors and the smell! How big a tank do I need? It might seem that all you need to do is measure your largest part and size your tank accordingly. Actually, a better route is to take a look at all your parts: If you are cleaning the same thing in every batch, or only deal with small parts, the choice is easy. But if you have a wide variety of part sizes and geometries, take a look at the mix. Are there just one or two large parts, and many smaller ones? It may not make sense to buy a larger system just for a few parts. Tank pricing rises rapidly with size. Do I really need heat? Unless you will always fill your tank with hot water, and refill it with hot water and cleaning chemistry every time it cools off, yes, you need heat. Ultrasonic energy moves best through water at a temperature betwwen 140 and 170 F. In addition, hot water helps dissolve many soils, further enhancing parts cleaning. Do I really need a parts basket? Maybe not. Remember that you don't want the parts resting on the bottom of the tank. This inhibits the transmission of energy through the water, as the transducers are mounted on the bottom. Some people with larger parts just make a simple stand or spacer to keep their parts off the bottom and it works fine. What should I put in this thing anyway? That depends on the part and the soil to be removed. Most common applications will be served by one of the cleaning solution offered here on our sight. Take a look at the ultrasonic solutions page. If you don't find what you need there, feel free to give us a call. We have a over a decade of experience in ultrasonic cleaning. If we can't help you, we will be happy to put you in touch with someone who can. I found some cheaper stuff elsewhere, why should I buy ultrasonic cleaners from you? New equipment from the largest, and the leading, manufacturers of ultrasonic equipment worldwide. All of our equipment carries two guarantees: the standard manufacturers warranty, and our 30 day DOA return policy guaranteeing satisfaction. There is always a cheaper source if you are willing to look hard enough. We do strive to be one of the least expensive sources for ultrasonic equipment on the net, and we know we offer the best value. To understand how an ultrasonic cleaner can perform cleaning or sonification, it helps to understand the principles of ultrasound and how they are applied in ultrasonic cleaning. Ultrasound is sound transmitted at frequencies beyond the range of human hearing. Ultrasonic energy generated by piezoelectric transducer at a rate of 40,000 times per second creates cavitation, the mechanism for ultrasonic cleaning. 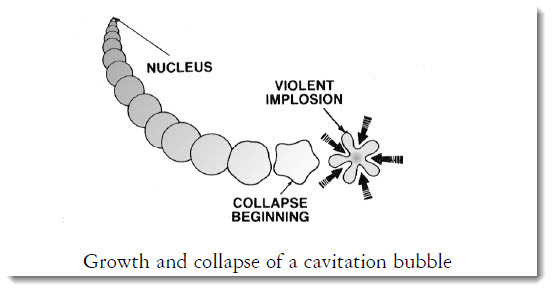 Cavitation consists of the formation and collapse of countless tiny cavities, or vacuum bubbles, in the liquid. The energy produces alternating high and low pressure waves within the liquid in the tank. The liquid is compressed during the high-pressure phase of the wave cycle, then pulled apart during the low-pressure phase. As the pressure in the liquid is reduced during the low-pressure phase, cavities grow from microscopic nuclei to a maximum critical diameter. During the subsequent high-pressure phase they are compressed and implode. The energy is powerful but safe for parts because it is localized at microscopic scale. • When selecting an ultrasonic cleaner, look for units that allow as much control as possible of these factors. For example, a microprocessor-based digital thermostatic control allows a constant display of the solution temperature for close monitoring and control. Heat also increases the chemical activity of cleaning solutions. Solution temperature generally should be kept between 120-140 deg. F. If the temperature and time can be controlled, then repeatable cleaning consistency can be achieved. • Adding a wetting agent or surfactant to the bath can reduce surface tension of the liquid. 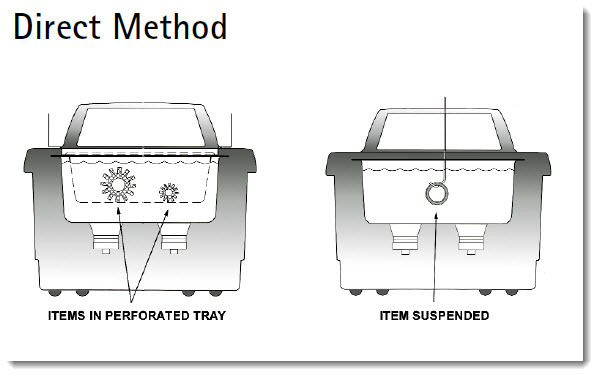 Reduced surface tension will increase cavitation strength. Medium vapor pressure is most conducive to ultrasound activity. Low vapor pressure produces cavitation bubbles that implode with relatively greater force, but results in fewer bubbles and a higher cavitation threshold. High vapor pressure is not very effective - more bubbles are created, but they collapse with less intensity due to a smaller internal/external pressure differential. Low viscosity promotes cavitation. high density creates intense cavitation with a greater implosive force. • Never place parts or receptacles directly on the bottom of the unit. It can cause the unit to fail because the parts will reflect the ultrasonic energy back into the transducer(s). 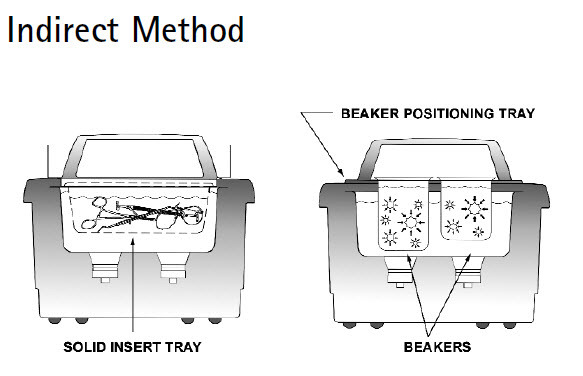 Always allow at least one inch between the tank bottom and the beaker or receptacle for adequate cavitation. • Never use solvents in a small benchtop cleaner. It is neither safe nor environmentally responsible. Solvents vaporize quickly. Vapors of flammable solutions can collect under the unit, where ignition is possible from electrical components. • Keep solution within one inch of the top of the unit when the beaker or tray in place. In the liquid versus cavitational activity relationship, it does not follow that less solution will intensify the activity. Units operate at optimum efficiency when filled to within one inch of the top. • Wait 5 to 10 minutes after activating the equipment for fresh solution to degas. This need not be repeated with subsequent use, as degassing is required only after the bath is freshly filled. • If using a tray or basket to lower the parts into the solution, it is better to use a holder that is of open construction, either a mesh basket or an insert tray, that is adequately perforated for drainage. This also permits free access of the sound waves to the parts. 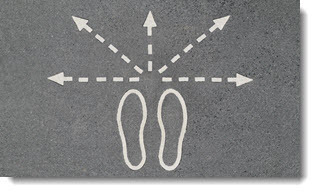 What is the difference between direct and indirect cleaning? How long will it take to clean my parts? Will an ultrasonic cleaner damage my parts? Do I have to fill my tank to the "Fill" line? Do I NEED a tank heater? Do I NEED a tray or basket? What's the best cleaning temperature? How do I drain my ultrasonic cleaner? Smaller units will not have a drain. these are usually supplied with a channel on one side of the cleaner to facilitate pouring out your cleaning solution. Pour out your old solution, then rinse out your tank before adding new solution. Be sure to properly dispose of your cleaning solution. Place the unit to allow easy reach of the drain tube into a waste disposal unit. expose the white teflon sealing tape on the drain pipe’s threads. until the handle is on top. stainless steel if retightening or refitting of the drain valve is required. tube over the barbed hose adaptor end. , lenses, instruments, and precision components. Powerful ultrasonics can support your industrial workflow. Get perfect, deep cleaning of blind holes and fine detail. Ultrasonic cleaning is perfect for removing: dirt, grease, waxes, and oils from light industrial parts and components of all kinds – including steel, light & nonferrous metals, plastic and glass. Safe precision cleaning for your delicate components. Completely remove flux and contaminants from: PC boards, SMDs, quartz crystals, capacitors, and many others. Especially good for clean up after repair and rework of iPhone, iPad, Tablet, and smartphone electronics. Safely and quickly remove support material from fused deposition modeling 3D-printed parts. Ultrasonic cleaning will speed up the removal of support material, reducing post-processing time and expediting the prototyping process. Ultrasonic cleaners are extremely versatile. They can also be used in laboratory applications for cell separation, cell lysing, mixing, emulsifying, sample preparation, and degassing of liquids. The firearm is fieldstripped, then placed in a stainless steel mesh basket and lowered into the heated tank containing a cleaning solution. The machine produces high frequency sound waves that cause alternating high and and low pressure areas resulting in the creation of millions of tiny bubbles that implode on the gun, resulting in a scrubbing action that cleans down to the microscopic level. The gun is removed from the cleaning solution, rinsed with clean water and dried with compressed air. It's then placed into a separate basket and tank containing lubricant and set onto the ultrasonic machine where the firearm is thoroughly lubricated through cavitation. The gun is removed from the tank and then excess oil is then wiped and blown off the gun with compressed air. The firearm is reassembled and is ready for use or storage. The complete process, not including fieldstripping and reassembly, can be performed in less than 10 minutes. The cleaning concentrate used, ChemCrest 235, is a mild alkaline-based cleaner with rust inhibitor. When mixed with water for use, it is nearly odorless. Guns are cleaned at approximately 125 degrees F.
Approximately 500 firearms can be cleaned with one gallon of CC235 cleaning concentrate, making it one of the most efficient cleaners available. The parts are lubricated with ChemCrest 400L lubricant, an odorless petroleum distillate that lubricates and protects firearms while removing moisture. The cleaning procedure is safe for both blued and stainless steel firearms, along with night sights, polymer frames and rubber or plastic grips. Wood grips, electronic sights and scope should be removed from the guns before immersion. On multiple firearm cleaning operations, use of the Crest Ultrasonics system increases actual output many times over hand cleaning, with tha parts restored to a uniform standard of factory-new cleanliness.